At first glance this may seem like odd fare for a Dialogue Incorporated review and admittedly little of our concentration falls to items bearing the tags “motion picture soundtrack” or “classical” and especially not to “Disney”. But The Cinematic Orchestra defies conventions that way and it’s in part because of this fact that they hold a unique and very personal position in the Dialogue annals. So pronounced is my admiration for this band that 2 years ago at one of their live performances here in Chicago I ran into an acquaintance I hadn’t seen in at least 3 years who told me that if it weren’t for me he would never have discovered the band or gone to the show. This year marks the 10-year anniversary of the first time I heard Jason Swinscoe, his orchestra, and their one-of-a-kind take on downtempo and jazz. Believe it or not I actually remember the trip to the record store. Nice Musique was a fantastic little shop in Madison, Wisconsin, run by local celebrity dj and good friend Nick Nice. From the first time I set foot in the shop it immediately set itself apart as a one-stop shop for my musical explorations. The place was clearly ahead of its time and even today there are few to rival it. It was here on the top slot of their downtempo picks wall that I spotted Motion, The Cinematic Orchestra’s debut album for Ninja Tune records. I may have even had to ask Nick to get it down for me it was so high up on the wall. Listening at one of the communal listening stations facing the street I remember staring out at a sunny, spring day and losing myself entirely to the band’s moody jazz textures, orchestral touches, layers of sampled vocals, and atmospherics. To date it was the coolest thing I think I’d ever heard and with the passing of each subsequent release they redefine the levels of cool with their depth and scope. They’ve matured quite a bit since ’99 and over the years the group has truly come to embody its name. 2003’s Man with the Movie Camera saw TCO compose an entire soundtrack for the Russian silent film of the same name. 2007’s Ma Fleur is self-described as “a soundtrack to a specially commissioned screenplay for an imagined film (which may or may not be made)” and it definitely sees Swinscoe and company embrace a more orchestral framework favoring sweeping strings and lush arrangements to their more jazz oriented beginnings. Now two years later they are poised to release their first actual soundtrack, commissioned (in reality) by Disney Nature for their documentary Les Ailes Pourpres (its working English title is Crimson Wing). 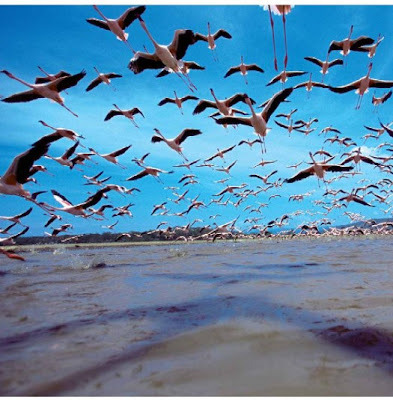 In a similar vein to March of the Penguins, Les Ailes… follows the lives of the Crimson Winged Flamingos from a remote lake in Northern Tanzania. 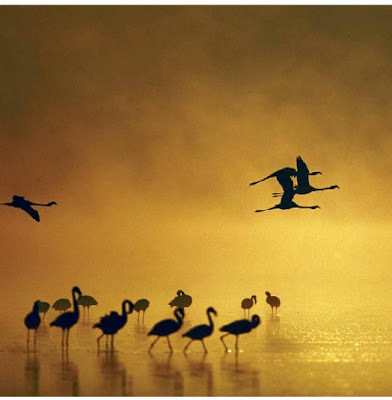 Fully channeling their vivid compositional style, TCO’s resulting soundtrack is a beauteous and peaceful oeuvre to the lifecycle of these exotic birds – and this (admittedly biased) high praise is only from hearing the soundtrack and having seen a three and a half minute trailer for the film. Maybe letting my imagination fly with images of Flamingos standing, stretching, running, dancing, and flying alongside waves of strings, vibes, piano, and acoustic guitar is part of what makes the listening so interesting but one thing is certain whether on its own or with an African lake for its backdrop The Cinematic Orchestra’s soundtrack is as rich a listening experience as any. I still remember when I first heard Fontella Bass on the Beat Conundrum radio show. Then I believe Greg chimed in and let everyone know that the cut was from a group called "The Cinematic Orchestra". The Album was "Every Day." From that point on I was hooked. The trailer for this looks great. Although it was using a track from Ma Fleur - do you think that this soundtrack will consist of entirely new material or a mix of new and not so old?